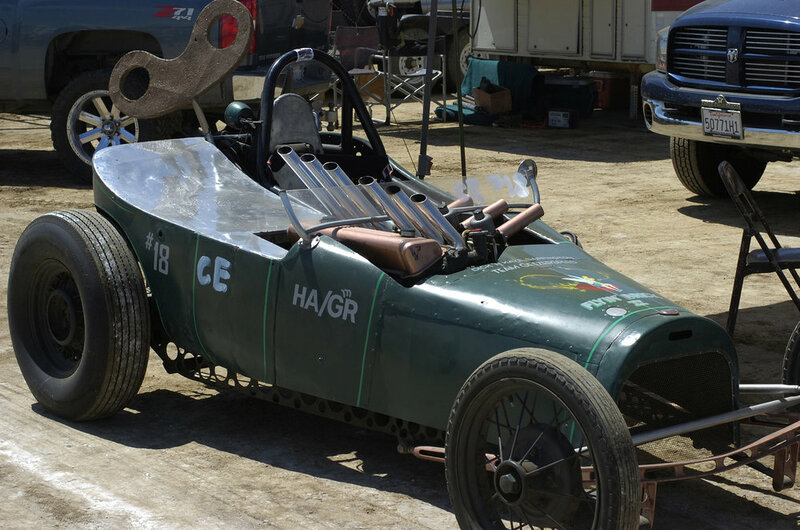 This home-built rocket-sled’s nosecone caught your eye, too, eh? Young dads with little dudes can check out the iron on the staging lanes at Eagle Field. 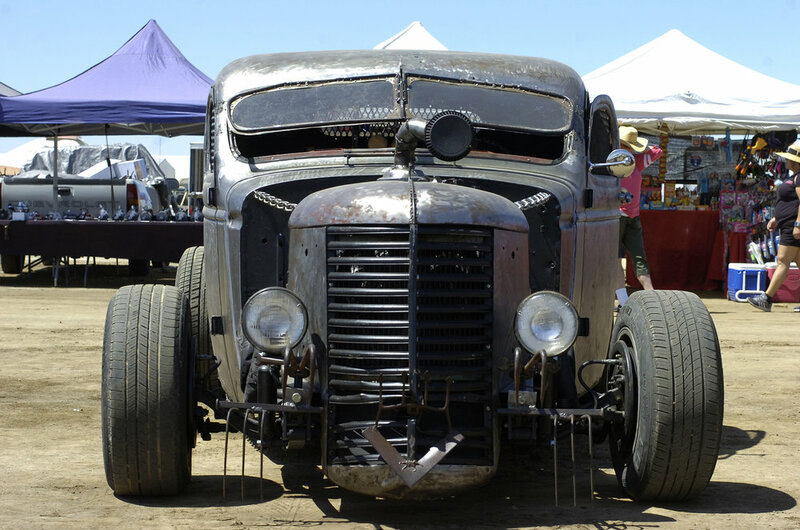 We were wondering how in heck the builder got the welded Franken-scars on this beastie to look oh-so-real. Blown, home-made Krate with zoomies: They always have and they still do at Eagle Field..
No. 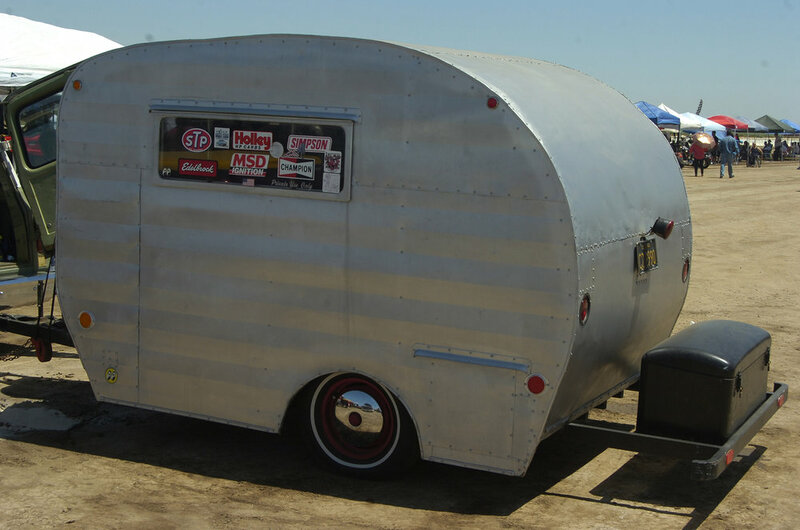 11 got there on a vintage trailer pulled by a ‘50s Ford Ranch Wagon. Spotlight | It can be warm and it might be dusty. Oh, and Eagle Field sells no beer. The event organizers say “no alcohol,” and none is available for sale, but figure this: Beer would probably make your three-hour visit about an hour and home. Out at Eagle Field, the friends and club members who staff and volunteer at the event are neighborly types. The wives and girlfriends who drive the tow vehicles and help to back the racers up after their burnouts look like people you went to school with. Off the track, the “Old Dudes Rule” types, the inked younger guys with beards, the nerdy car-boys checking it all out with their grey-beard dads? 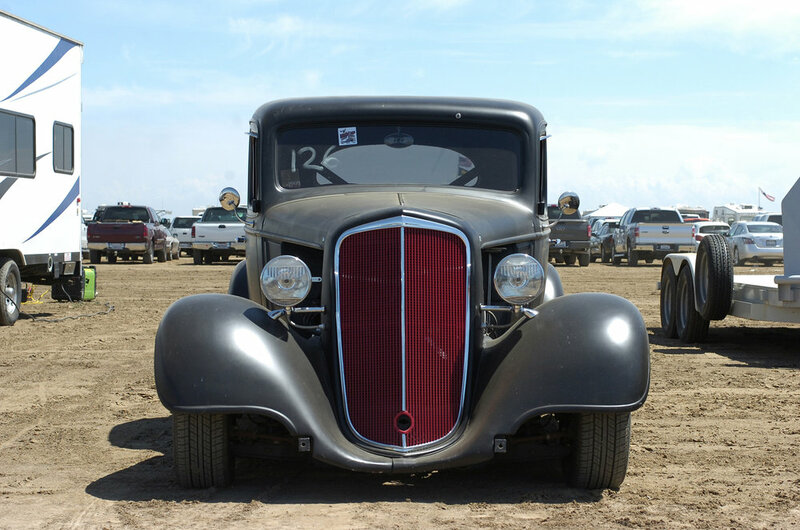 All folks who love loud machines, love keeping old iron going, love all the geeky talk about parts and people and racing, and love to do it all at Eagle Field each spring. My brother and I have been to the Eagle Field Drags three times so far. 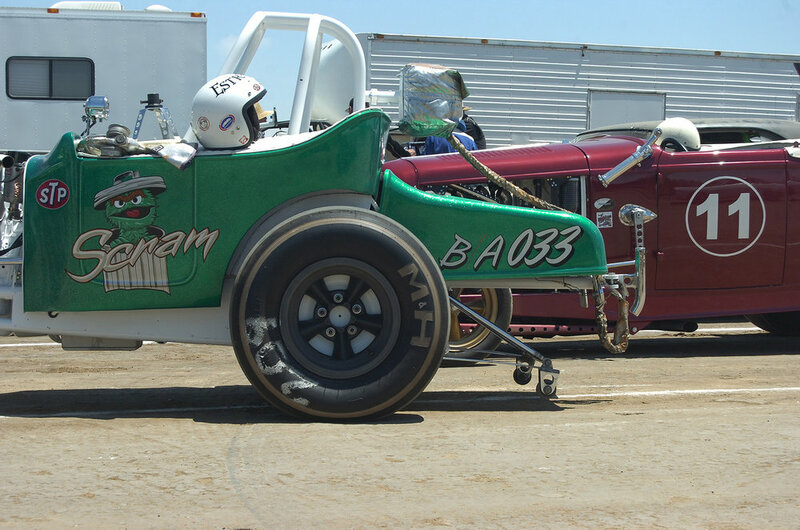 We weren’t racers growing up, but we’ve always been nuts for wheels. 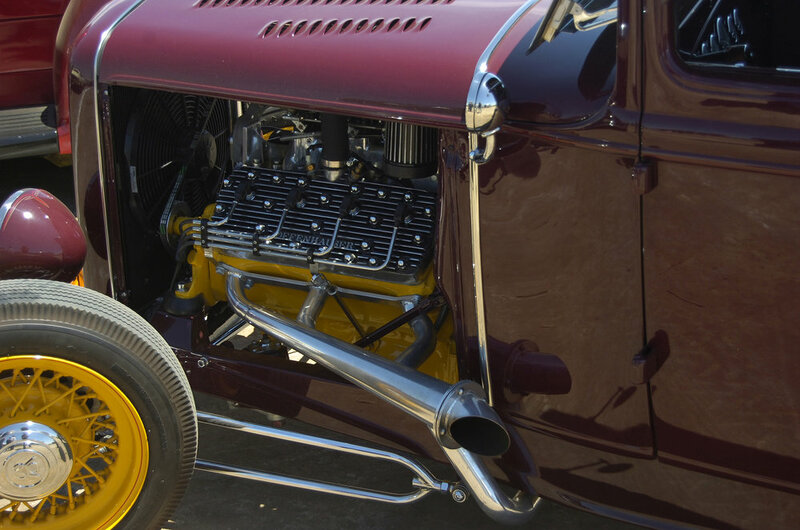 We built model kits in the good old days, raced big slot cars when that was a thing, did terrible chopped-up things to hapless bicycles, made other two-wheeled things that went vroom, and owned and traded those gas-hog American cars that need octane boost today. We never got to build something for the strip, but we knew of the legends and backyard builders who created the machines that ran the quarter. 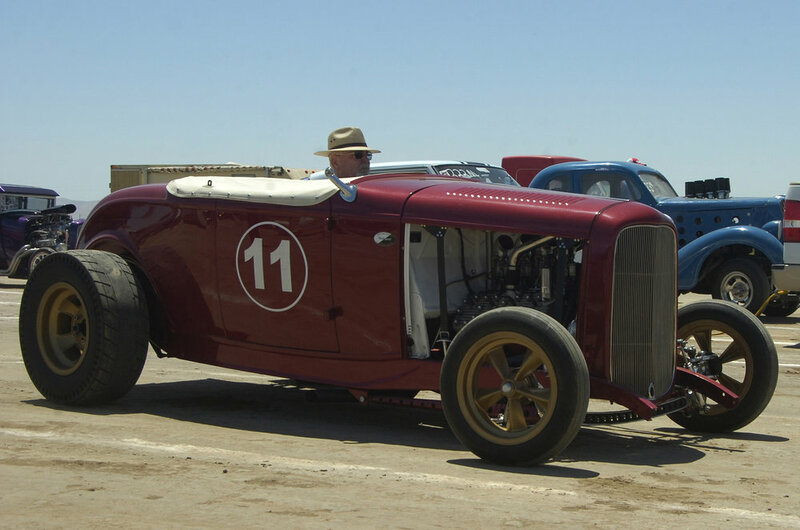 We were town kids in Kerman, out west of Fresno, where there was a certain level of racing awareness even among those of us who weren’t racers. We’d see the builders when we visited the local auto parts and machine shop. There were garage-wrenchers who had things fixed at the blacksmith shop-turned radiator service. Flashy stuff went through town on trailers, headed out for some race somewhere. And there were occasional zoomie-zooms down Madera Avenue, our Main Street, but the local constabulary kept a lid on most of that. There were unpublicized drags here and there outside town, my brother reminded me. There’s plenty of two-lane blacktop way off the highway out there, and some of it’s not all boogered up with smashed tomatoes or cantaloupes from the recent harvest. It almost looks real enough to use on a movie set. Eagle Field was originally a training strip for pilots starting in World War II. 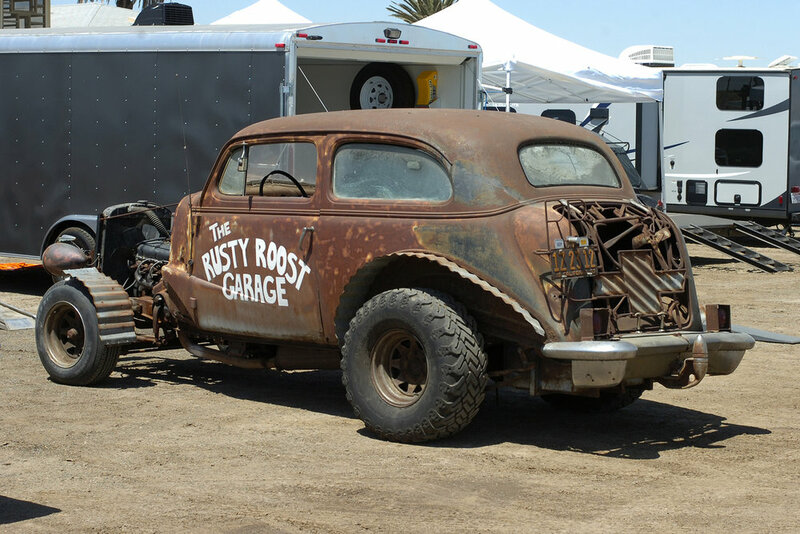 Now it's where vintage war machines go for their retirement and restoration. Airplanes, tanks, troop haulers, ambulances, Jeeps: There's a place for it among the old iron at Eagle Field. 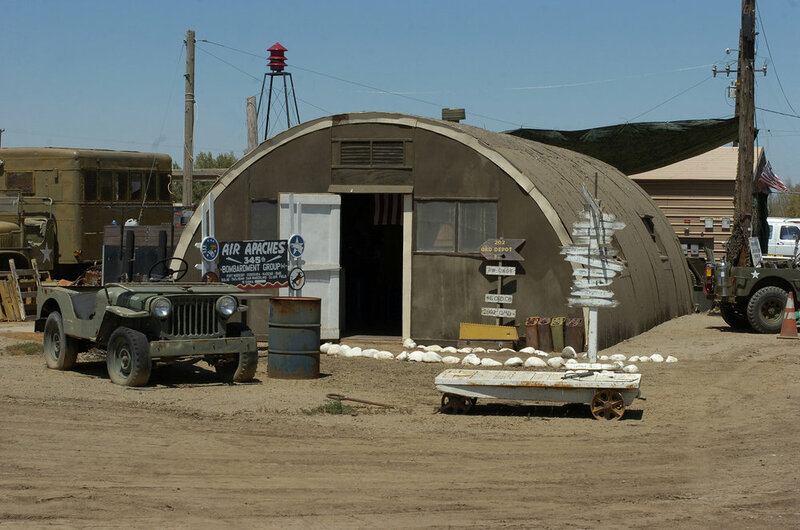 Farther north and west from our hometown, the old Eagle Field airstrip was where war-bound Army Air fliers learned to do their thing starting back in 1943. Today it’s a sort of military-machine boneyard aiming to be a museum. 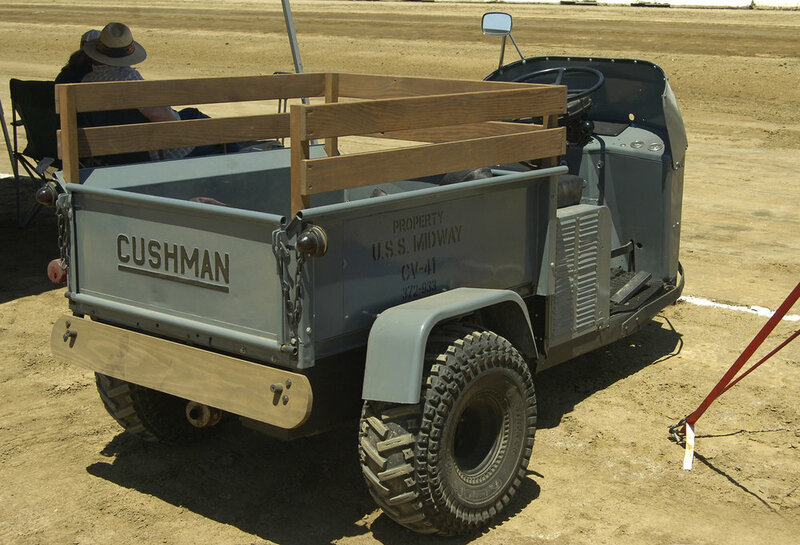 It looks a lot like a “M*A*S*H” set right now, and it’s worth a look. 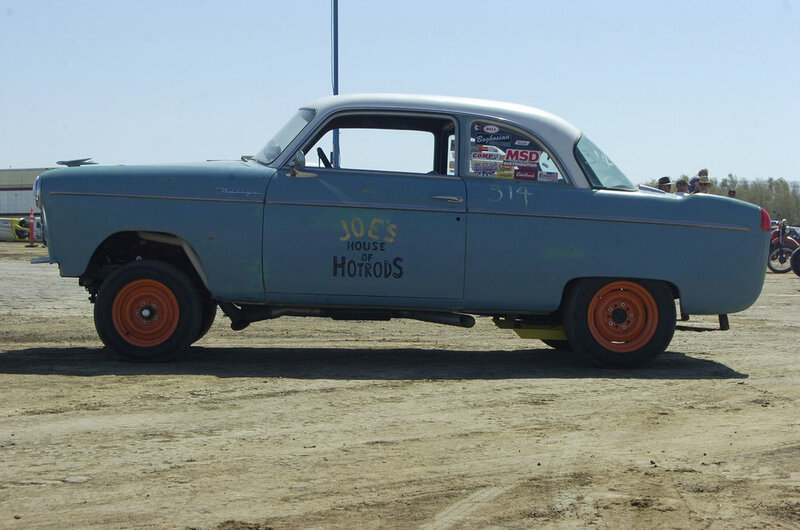 Benefiting the continuing plans to collect and preserve all that olive-drab iron and flying hardware, the Eagle Field Drags are an annual run-what-ya-brung gathering that pays tribute to the old-school racing at strips such as Raisin City, southwest of Fresno. This beefed-up Truckster was on the spectator side of the Eagle Field strip. Eagle Field’s eighth-mile is an old airstrip, not a made-for-racing dragstrip, but no one has a problem with it. The friendly Eagle Field-club codger in a golf cart reminded us of that when he saw us moseying back from near the airplanes and military vehicles toward the pits and the strip and gave us a lift. Dunno why he picked us up. Neighborly, I guess. There are some swap rows next to some unusual projects on trailers ready to take home: We saw a Corvair Rampside, a cabover tow truck and a Crosley door-slammer. There are always a couple of rows of guys selling general and specific stuff that could be useful to you: old magazines, new magnetos, barn-find motorcycles, intake manifolds. Then mosey down a little midway filled with vehicles that are entitled to park up close because they’re pre-’73, and you’re nearly to a grandstand of sorts, to the right and set back from the short wall along the strip. You can bring your EZ-Up if you get there early for a space that’s big enough for your shade. Food and T-shirt vendors are on the other side of that old-car midway. So far, we’ve opted to go around the lines of staging and plunk down on the other side of the starting line and under the announcers’ stand. Clearer sight lines and smaller crowds, and though the announcer is right above us, the P.A. is pointed toward the other side of the strip. We can just sort-of hear the commentary, but it hasn't bothered us much. 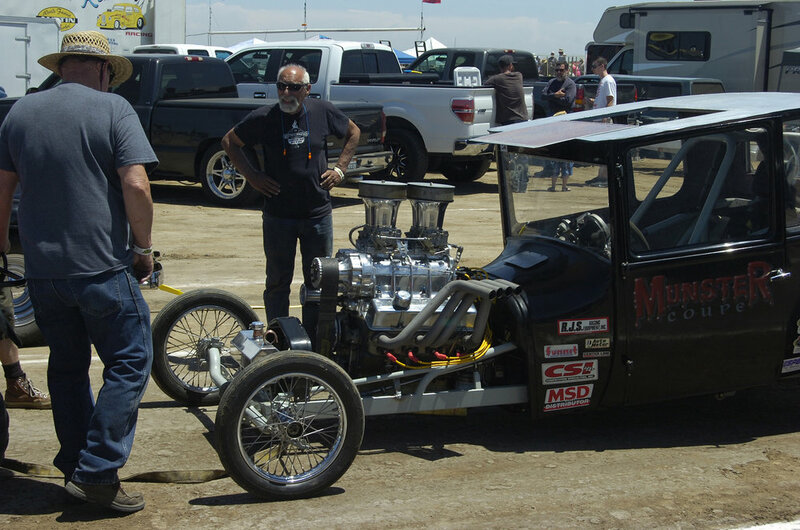 The whole affair is called the Fresno Dragways Reunion. Friday is all door-slammers and grudge-matches. Sunday is the Lions Drag Race, which has Christmas-tree starts and allows pre’73 imports. Oscar means business: wheelie bars and ‘chute. Canned ham with a trunk for some junk. Mad Maxey as all get-out. Grey-beards: This Offy’s for you. The restored Ike Iacono slingshot from 1958. The Flyin’ Brick II: Wind it up and go, yo. On Saturday, the times we’ve gone, it’s “Gassers, dragsters, hot rods, mini-bikes, muscle cars and more.” Saturday means a flagman there on the strip: Line up behind the water guys, wait for the all-clear, pull in and do a major or minor burnout and then get ready for the flagman to make sure your visor’s down and your window’s up. He’ll point to you, left, and you, right, then unfurl, jump and wave the green. Go, dog. 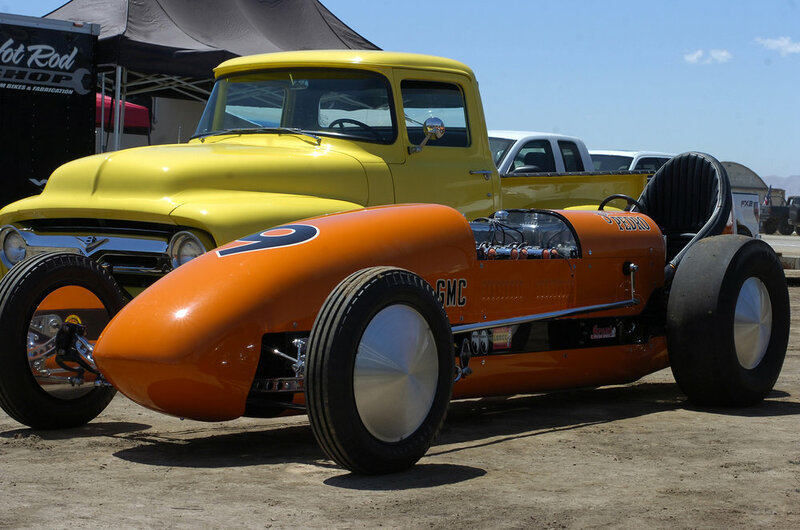 This year’s special attractions included Jeff Atamian’s “The Beast” jet car, the Brunelli & Dunn Twin Engine Dragster and the wheel-stander General Jerry Lee. But go for the family-built jobs. It’s right neighborly. It’s $20 each to get in. Well worth supporting the cause and seeing that old iron that’s just too good for the street. To get to Eagle Field, go to the far west side of the San Joaquin Valley, down where Interstate 5 is mashed up against those badland foothills. It’s about 20 minutes off I-5 or an hour northwest of Fresno.